Carole's Chatter: Not really ... I don't think I've ever managed one! Not really ... I don't think I've ever managed one! Oh! I loved gymnastics and I believe that I have done many cartwheels in my life. 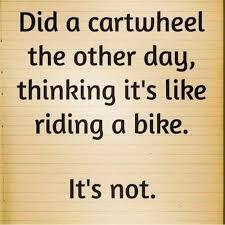 This stuck my funny bone because I actually did this when I was in my 40's thinking I could still do it, well I did it but boy did I hurt all over later.